The last time you went to bed sore from a workout and woke up feeling fine, did you remember to thank glutamine? How about the last time you fought off a nasty cold, or digested some food? No? Well, maybe next time you should. Glutamine is an amino acid (a building block of protein), and it’s essential for all of the above, not to mention all kinds of other functions. In fact, your body contains more glutamine than any other amino acid, mostly in your muscles. It’s one of your brain’s favorite proteins, and it’s fuel for any cells that have to divide very fast, most relevantly immune cells and the cells lining the wall of the gut. 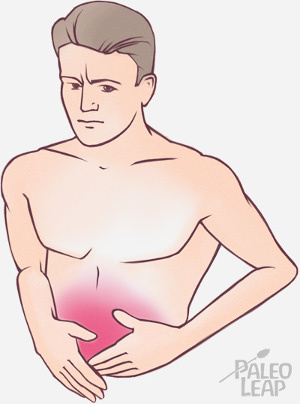 Serious injury or illness, especially gastrointestinal problems. That sounds suspiciously like the problems that drive people to Paleo in the first place! So take a look at the story behind this little-known amino acid: what it does for you, and whether or not you can improve your health with a supplement. This review notes that only study to date that helped was in extremely well-trained athletes (marathon and ultramarathon runners) – that’s great for them, but it doesn’t apply to most of us. This study found that glutamine supplementation delayed DOMS but had no other effect in men training on a leg press. This study found no significant effect of glutamine supplements on muscle gain, strength, or muscle protein composition in adults doing moderate weight-training. The upshot: unless you’re in the top 0.1% of athletes, save your money on glutamine supplements and just get enough high-quality animal protein. A less-advertised but more common role for glutamine is in a hospital setting. When patients are recovering from any kind of serious illness or surgery, glutamine can significantly reduce the recovery time. Doctors have tested this especially in patients who need enteral nutrition (usually known as a “feeding tube”). Adding glutamine to the tube gives trauma victims a better shot at recovery and reduces the death toll. It also helps avoid surgery-related infections and aids in burn recovery. Again, this showcases the status of glutamine as “conditionally essential:” under very extreme conditions like massive burns or systemic trauma, it’s highly beneficial, but there’s no evidence that this extends to improving health in people who are already doing fine. Everything always seems to come back to the gut, doesn’t it? Glutamine is an essential nutrient for maintaining a healthy gut lining (the barrier that keeps your food in your digestive system and not in your bloodstream). But can you make enough of it by yourself? Or will it help to supplement, especially for people who struggle with digestive disorders? The answer seems to depend on how damaged your gut is in the first place. In this study, glutamine helped maintain gut function and protein balance in abdominal surgery patients who had to have parenteral nutrition (feeding tubes): the glutamine group did significantly better than the control group. It’s also had good results in patients undergoing chemotherapy, which is extremely hard on the digestive system (not to mention everything else). Even more dramatically, glutamine can literally be a lifesaver for patients with HIV/AIDS, who often take very high doses to increase nutrient absorption, preventing muscle wasting and dangerous weight loss. On the other hand, studies in patients with IBD have failed to show any improvement from supplementation. And there isn’t enough evidence to make a call for Crohn’s Disease or other gastrointestinal conditions. So in the absence of very extreme disease states, there isn’t much evidence that glutamine will improve gut function. The fact that something helps a very sick person does not mean it will do anything for a healthy person. Here’s the section you really wanted to know about. There’s a persistent line in low-carb and Paleo circles that L-glutamine is an instant quencher for sugar cravings. But if you read around, you’ll notice something suspiciously absent: sources. When blood sugar is low, glutamine is easy to convert to glucose. In this study, glutamine was even better than pure glucose in treating hypoglycemia (although this study found the opposite was true in diabetics!). Glutamine may help in improving insulin sensitivity. Then there’s a lot of anecdotal evidence from people who have used glutamine for cravings – but considering that this kind of evidence is prone to biased reporting and the placebo effect, it doesn’t count as hard science. It’s possible that glutamine hits the spot for carbohydrate cravings simply because it gets converted to glucose so fast. In other words, you basically are taking carbs when you’re taking glutamine. Protein in general also helps reduce sugar cravings, so it’s possible that glutamine just works because it’s protein. It’s also perfectly possible that there really is something special about glutamine – but there’s no evidence supporting this yet. The upshot: if it helps you, there’s no harm in it – even if it’s just the placebo effect, an effective placebo sometimes does the job! 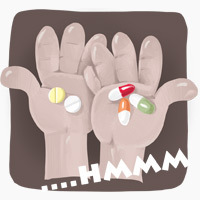 But there’s not enough hard evidence to evaluate the claims about sugar cravings and glutamine for better or for worse. To make a long story short, the classification of glutamine as “conditionally essential” is pretty much spot on. Yes, it’s important. It’s even crucial. But healthy people can get plenty of glutamine through whole foods and by synthesizing it themselves. If you’re eating plenty of animal protein, you’re guaranteed to be getting all the essential amino acids you need, and that gives your body everything it needs to make all the glutamine it can use. There’s no evidence that people who aren’t struggling with very serious diseases or injuries will see any benefit from glutamine supplements: your money would be better spent on high-quality animal protein from whole foods. On the other hand, if taking an L-glutamine supplement helps you personally manage sugar cravings, there’s no reason to stop taking it, since it also hasn’t been shown to cause any harm.